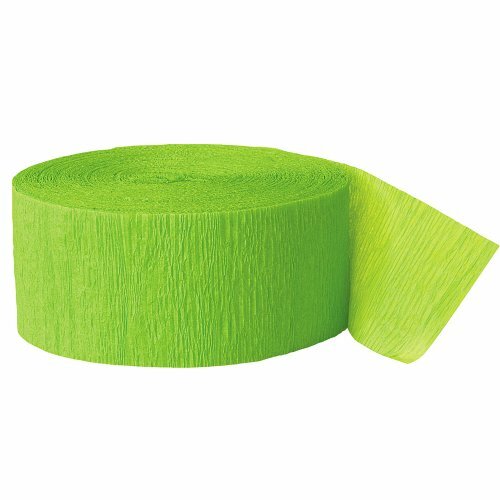 Add some zest to your party or special event with our roll of 500ft Lime Green Crepe Streamer. Lime Green Streamers are versatile party decorations with tons of creative uses for any special occasion - twist, drape, or hang this solid Lime Green Party Streamer to brighten up any home, school, or office celebration. Combine with other solid color and printed party supplies to create a party style that's uniquely you! Package contains one roll of 1.75" x 500' Lime Green Crepe Streamer. Lime Green party decorations are perfect for any luau, fiesta, summer theme party, or for everyday entertaining!